Dolly Bonson, aged 95, died in March, 1988. To most people who knew her, she was the typical white-haired lady next door—quiet, gentle and always ready to lend a hand. In short, she was the last person one would suspect of having a secret past. A church-going Christian for most of her long life but never baptised, it was while she was actually standing waist-deep in the baptismal font that all was revealed. She quietly announced to the congregation that she was Bett Bett, the Aboriginal servant girl featured in We of the Never-Never and the lead character in The Little Black Princess books by Jeannie Gunn. now part of Australian folklore. It had been thought that Bett Bett had disappeared into the vast Australian bush in 1902. It was then 1969. I first heard about this in 1994, when I was commissioned to write her biography. The brief from the publisher was to create a short story, to be used for Christian outreach to Aboriginal and Torres Strait Island communities throughout Australia. There were two main challenges. 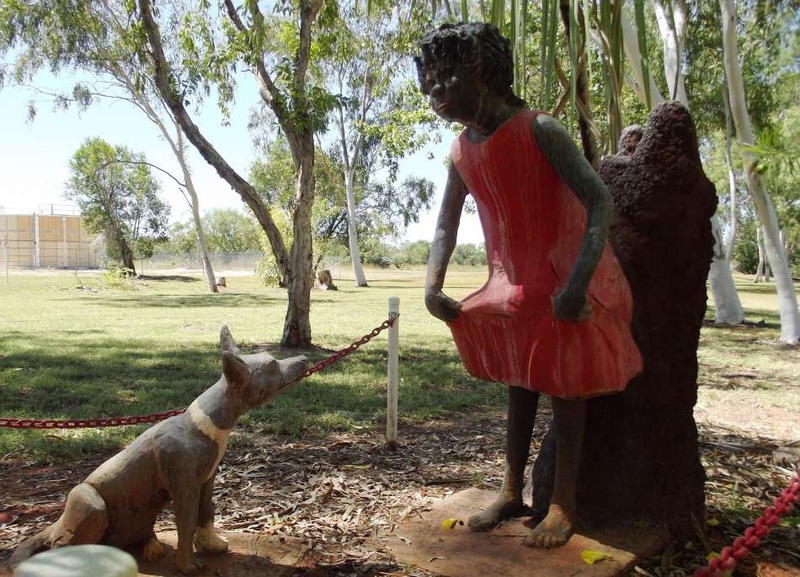 One was to find out what happened to Dolly in the years since Mrs Gunn unavoidably left her as a bewildered, skinny eight-year-old in the Northern Territory. The other was to grapple with the cultural dynamics that had influenced her life since then. Neither challenge proved easy. For one thing, Dolly had been deceased for six years when I was handed the task, so I could hardly talk to her. Instead, I had to rely on a scratchy video interview conducted some years before her death. But most valuable was my long-distance contact with her youngest daughter, Flo, who lived in Darwin. Along with some library research at the Australian National University, relevant cultural centres and interviewing other people who had been involved, I started to piece together the jigsaw of her life—a roller-coaster of pain, pleasure and finally the serenity of old age. Sometime in 1894, deep in the “Top End,” near the Katherine and Roper Rivers, Dolly was born in the traditional way—mother-to-be and midwife, alone in the flat scrub. On her arrival, the mother, Gmurdi—recognising the newborn’s light skin—hysterically opted to leave her on an antbed rather than suffer the embarrassment of having a “half-caste” child—and a girl at that. Dolly was rescued by her aunt Djoodi, who became her surrogate mother. Dolly’s early life was typically tribal, moving from place toplace, sourcing food and avoiding war parties or tribal kidnappers. Just as sinister were the government authorities, which at that time had a policy of forced relocation for Aboriginal children—regardless of the protests of their natural families. To the end of her days, Dolly expressed surprise that, on a number of occasions, she was able to evade the government officials. (Interestingly, it was a few months after the release of my book that the term “stolen generation” was first used to describe this activity.) In 1902, Aenaeus Gunn moved to Elsey Station as manager. For his wife, Jeannie, it was a harsh introduction to the Australian bush. Through an arrangement between Djoodi and Dolly’s European father, Dolly was sent to the homestead as a maidservant. Her antics became part of Australian folklore through Mrs Gunn’s two bestselling books—possibly the first sensitive descriptions of life in the outback. When Jeannie reluctantly left Elsey after her husband died, Dolly was distraught. But the event brought her into contact with her white father, Mr Cummings, for the first time. They became great friends, although the relationship was legally and culturally prohibited. Dolly was caught between two worlds. Her own culture wouldn’t accept her whiteness and the white community refused to accept her Aboriginal heritage. Dolly soon became a liability to her constantly travelling father, so she was reluctantly sent to a boarding house in Darwin. For the next decade, apart from some short moments of relative happiness, life was tough. Her only significant relief was a short spell with the Ward family, who introduced her to their church. They even took her to Adelaide on a holiday and arranged for a reunion with Jeannie Gunn. But just as things began to look rosy, the Wards were permanently transferred from Darwin to Adelaide and Dolly was alone again. Her next foster family treated her harshly but allowed her to continue to go to church. These were dark years. She was forced to work as a barmaid and was propositioned on many occasions at the encouragement of her foster-parents. Fortunately, at Dolly’s courageous insistence, a government official intervened and Dolly—confused, beaten and abused—was able to find new accommodation. She had lived in seven homes in her 17 years of life. She could not have guessed that the worst was over. In all this time, there was never a connection with the fact that her name was in books all over Australia and overseas. Bett Bett had simply disappeared. In 1918, she met and married Joe Bonson, a handsome Englishman. Their close relationship lasted until he died, 40 years later. Over the years, the Bonsons became part of the Darwin community. They had five children and only once experienced separation—during the Darwin bombing in World War II, Dolly and the children fled temporarily to Merbein, near Mildura, Victoria. Just after the war, Flo, the youngest daughter, was rummaging through her mother’s papers when she found letters from Mrs Gunn. A few lines in and she realised she had to have a quiet chat with her mother. Dolly patiently explained to Flo that she had told Joe about her past life as Bett Bett before they married but had deliberately kept things quiet so they could live “normal” lives. Flo was to respect the secret until her mother decided to announce it to the world, in her own time—standing in the baptismal water, in 1969, when she became a member of the Darwin Seventh- day Adventist church. During an evangelistic meeting she and Flo had attended out of curiosity, Dolly had seen a picture of Jesus descending to earth through the stars. To her surprise and delight, it was the same unforgettable picture she had seen in a dream some time before. Dolly insisted on being baptised right away. There were a couple of newspaper articles at the time but then silence. Dolly never sought fame. The roller-coaster ride that was Dolly’s life had yet another twist. After Joe died and Dolly was living in Darwin with Flo, Cyclone Tracy hit with a vengeance in 1974. Their house was destroyed around them as the two women crouched under a double bed. A photo taken at the time shows a bare mattress, completely surrounded by a shattered house. Like many other Darwinians, Dolly moved into a caravan until the home was restored. Life held no more dramas for Dolly, who lived to a ripe old age—being a friend to everyone. It was a pleasant end to her story. But it wasn’t the end of my story. A good friend of mine happened to be visiting Townsville at the same time that Flo came across from Darwin to attend a Christian camp. I arranged for the delivery of a draft copy of the story. Flo opened the envelope, read the title and promptly burst into tears. My friend didn’t know what to think or say. Stuttering through her tears, Flo asked him how I knew the secret that only she and her mother had known. Dolly had loved the stars and talked to them as friends, exactly as I had imagined. Flo’s first and lasting reaction was that the Holy Spirit had planted the theme in my mind—and that the book was meant to be.